As we pootled down the coast the scenery continued to change, with the sign of cars, buildings, noise, and even a new marina under construction, all things we’d grown used to being without for the last week or so. We were begrudgingly making our way back to civilisation and ended up returning to Yeni Erenkoy, our first stop in the Kuzay Kibris Rally. Except this time, rather than scraping our way into the fishing harbour, we decided to drop anchor just outside in an area we named the Duck Pond, so called because of the duck mating calls we were greeted with as we entered. Over the next couple of days we were continuously entertained by various birdsong in this area, including a skylark, my favourite. I haven’t heard one of those for some years so you can imagine the nostalgia of English country summers that bird conjured up for me. It was an incomplete memory though because I was missing a pint of Adnams. Cor, what would I do for a pint of ale right now? 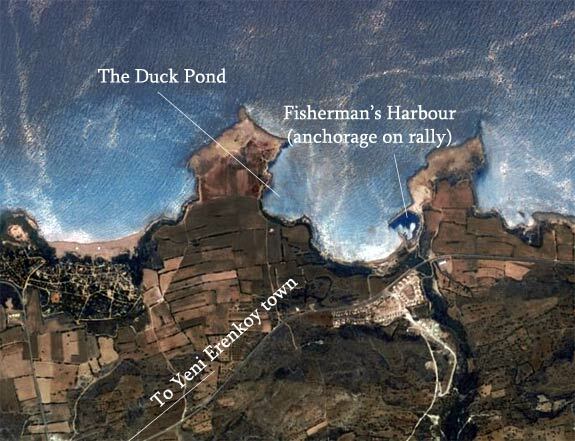 Image shows the original anchorage for the rally in the fishing harbour. When we returned we anchored in the Duck Pond. 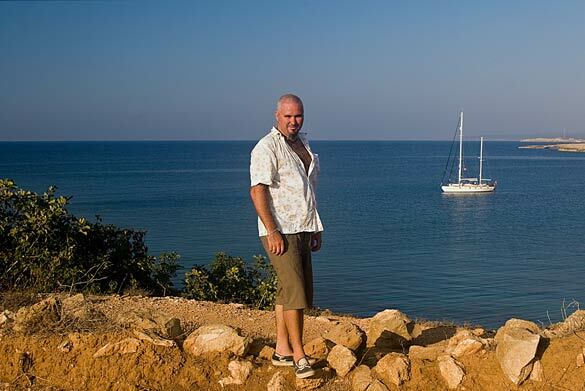 One coup we pulled off was to get a local’s perspective on this part of Cyprus, called the Karpaz region. As you may have noticed from reading the log this part of Cyprus is pretty unspoiled. That’s not to say there’s no building work or development happening. We met a very nice ex-pat called Maria who is MD of Busy Bees estate agents, and she introduced us to her colleague, Jim of Belgravia Estates (pictured). Jim, a Turkish Cypriot who spent 40 years in the UK, very kindly drove us in to Yeni Erenkoy town so we could provision, and then took us back the long route, across the Karpaz countryside. It was very strange seeing the same scenery from a car looking out to sea, as opposed to from our boat looking inwards. 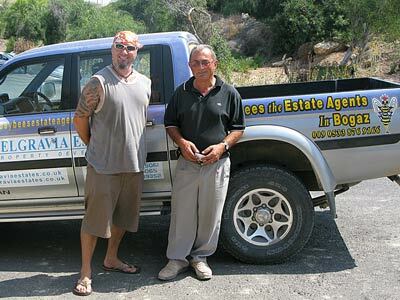 Jim chatted about the town of Yeni Erenkoy: “It is one of the few remaining towns left in Cyprus that is still occupied by both Greeks and Turks”, he explained. “They live in harmony with no problems”. As he said this we drove past a mosque on our left and a church on our right, as if to prove his point. Should you be interested this is his email address and this is the Busy Bee website. If you’re quick enough, you might just grab yourself a long-term investment in a wonderful part of Karpaz! Karpaz is the best. You must come here to believe it. You will be welcomed by Jim Hasip, the developer from Belgravia Estates and and Maria from Busy Bee’s estates agents. We don’t normally allow blatant self-promotion but the comment below is from the very same Jim who kindly took us on this little tour of Karpaz, as described and pictured above. Thanks Jim! Of course we do, Jim. Hope you are keeping well. We have fond memories of our visit there and hope to return one day. he he lovely to hear from you guys take care and hope to cross our path again .Good luck to Both of you .